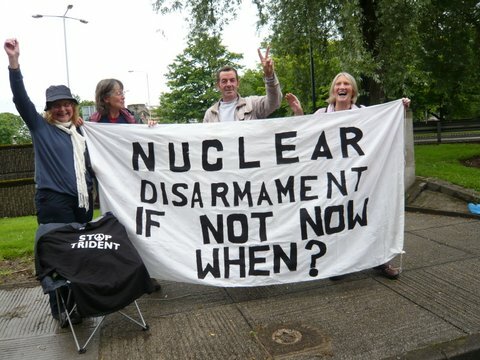 Peace Campaigner, Sylvia Boyes, spent two nights in police custody when she hung a ‘Give Peace a Chance’ banner outside the Faslane Nuclear Submarine Base in Scotland. 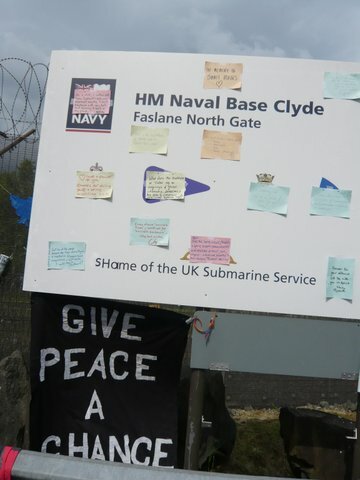 The incident happened on Saturday 7th July when Sylvia and a fellow campaigner from the Faslane Peace Camp, decorated the North Gate with banners and blockaded the entrance, refusing to allow entry to a cyclist and a delivery man. On Monday 9th July Sylvia was handcuffed and taken to Dumbarton Sheriff’s Court, where she was placed in a holding cell with other female prisoners, to then be let out an hour later having had no court appearance or official charge made. Sylvia believes this tactic is increasingly being used by the police to remove protesters from demonstrations without the need to establish formal charges and court cases, which would allow for the issues to be discussed openly in the public domain. Had Sylvia accepted her bail conditions of not re-joining the Faslane Peace Camp she could have been released earlier, however, Sylvia remains defiant that her involvement in peace camps is essential to make the point that what happens behind the weld mesh fences, razor wire and police security does not happen in her name. “You have to work hard to not allow the experience to be stressful”. It is questionable what arrests like this achieve, for upon her release and still not deterred from protest, Sylvia walked outside the perimeter of Coulport Trident Base and across the very hills that store the Trident War Heads in silos deep underground. Once again Sylvia found herself stopped by police but this time negotiated a 15 minute peace vigil before being accompanied for the remainder of her walk; arguably a much more beneficial tactic for both the protester and the state. Due to the Waddington International Airshow, which will close surrounding roads, the Peace Camp has been postponed until Friday 6th July. Helen John is to set up a Women’s Peace Camp near RAF Waddington in protest over the new generation of unmanned armed drones that will operate from the base. The camp will reside on the A15 towards Seaford, approximately 5 miles outside Lincoln and she is inviting other women to join her from Saturday 30th June onwards. “This is a camp for women to come together and take a step to protect the future. We can’t just talk about it, we’ve got to do something”. Drones are unmanned aerial vehicles which can be operated from the ground, as in the case of RAF Waddington, or be designed to follow a pre-programmed mission. There have been over 40 drone attacks in Pakistan since 2009 and research from The Brookings Institute shows that for every militant leader killed, 10 civilians also died. With drones imposing no risk to the crew operating them they are becoming the preferred weapon of choice, but Helen argues that they are illegal, murderous weapons that need to be stopped. If you feel strongly about drones and would like to find out more about the women’s peace camp call Helen on 01535 603240. 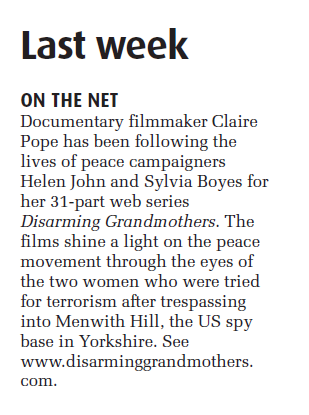 Disarming Grandmothers gets a mention in The Big Issue in the North! Disarming Grandmothers hits the airwaves on Jack FM! Disarming Grandmothers… the Web Series is released! ‘The right to protest, assemble and freely express ourselves is fundamental to British democracy. Since the misnamed, misjudged ‘War on Terror’ began new legislation has disproportionately restricted the right of protest, and from Parliament Square to Menwith Hill attempts have been made to remove peaceful dissenters from the very places they are best heard. To find out more about the grandmothers and Menwith Hill watch the opening trilogy. Sylvia is leading a ‘How can we oppose Militarism in our Communities’ workshop at the Occupy Menwith Camp on 16th April, 12 – 1pm. Email info@yorkshirecnd.org.uk for more details. Hear Helen on Radio 4! Helen takes part in a discussion about Greenham Common Women’s Peace Camp alongside fellow peace campaigners Katherine Jones and Rebecca Johnson.